(Nanowerk News) Nanopositioning specialist PI exhibits its latest 6-axis robotics positioning system at the MD&M West show, the world's largest medical design & manufacturing event. The miniature hexapod system provides more than 10 lbs of force and motion in all six degrees of freedom. It can be used for manufacturing and placing of parts requiring very high precision, for microscopy applications or laser and optical alignment. After two decades of experience with the design and production of hexapod robots, PI’s electro-mechanical / piezoelectric six-axis positioners are among the most advanced multiaxis precision motion control systems in the world. The limited space necessitated the usage of new technologies for encoders, motors and other integrated electronic components. The M-810 is compatible with PI’s tried and proven hexapod controllers that are supported by windows software and a library of drivers and programming examples for applications such as optical alignment etc. PI also provides simulation tools for hexapod integration. PI Hexapods come with load ranges from 2 kg to >1000 kg. Precision manufacturing, high precision placement of parts; alignment of optical components & lasers, microscopy applications, neuroscience. PI is a leading manufacturer of hexapod robotic positioning systems, piezo stages, piezo linear motors and precision motion-control equipment. PI has been developing and manufacturing standard & custom precision products with piezoceramic and electromagnetic drives for 35+ years. The company has been ISO 9001 certified since 1994 and provides innovative, high-quality solutions for OEM and research. 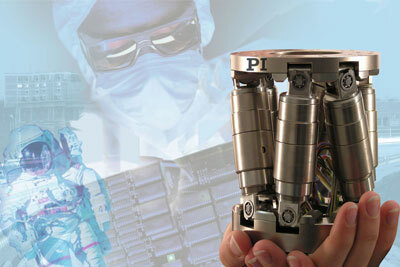 PI is present worldwide with eight subsidiaries.